Now heading into its third year, the Script P.I.M.P. (Pipeline Into Motion Pictures) Screenwriting Competition sprung out of a recurring complaint Chadwick Clough was hearing in his online community. 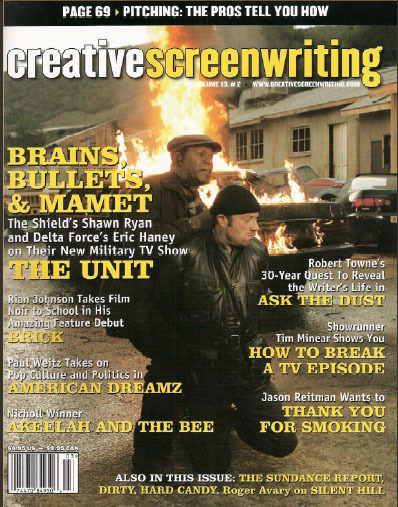 “Our writer clients continued to express their frustration with smaller screenplay competitions and we set out to do it right,” says Clough, who also writes CS’s “Production Co. Spotlight” column. Clough’s experience with script consulting and production companies, along with his management position at Script P.I.M.P., convinced him he could also be a contest director. Recognized as a cutting-edge competition, Script P.I.M.P. allows for online submissions and guarantees that each script will receive at least two reads from a judging panel of agents, development directors, and managers. All finalists become part of the extensive Script P.I.M.P. online community and get a free, five-year membership to their Writers Database (a massive collection of contact information, production company listings, and general industry facts). A Writers Workshop is also available to help develop scripts even further.